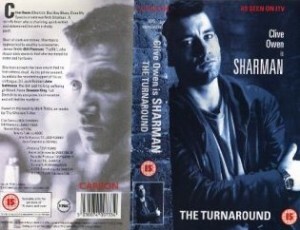 The pilot episode of Sharman is based on the book The Turnaround. It follows the plot closely and has Nick Sharman (Clive Owen) hired to find out who murdered the mysterious James Webb’s sister and family and why. The main witness is soon murdered and guess who the prime suspect is? Aided slightly by D.I. Robber, Sharman must break the case to clear his muddy old name and to rescue his kidnapped daughter Judith and girlfriend Fiona. The photo on the right shows Clive Owen, Grahame Fox and Suri Krishnamma in between shooting. Grahame Fox plays DI Jackson who arrests Shraman for the muder of the accountant. The scene with him in the police station is one of my favourites. 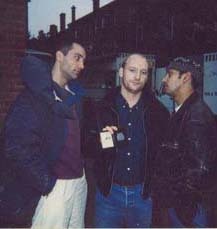 Grahame has also been in The Bill no less than four times and stared in the films Lava and Bodywork. Thanks Grahame for the photo. The episode also features the James Bond song ‘We Have All The Time In The World’, which is ironic now as there was a campaign for Clive Owen to play Bond. Look out for a cameo by Mark Timlin. He can be seen in the night club scene, he throws Sharman a cigarette whilst Fiona is singing. The Turnaround w as released on VHS shortly after transmission. This was the only episode released on this format. 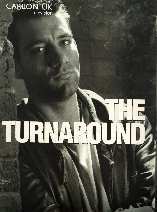 The Turnaround, is also available on DVD in Sharman: The complete series. The DVD features all episodes.